My post-holiday baked goods hangover didn’t last long. Who wants some brownies?! I’ve mentioned it before, two of my favorite things in the food world are chocolate (duh) and Bailey’s Irish Cream. The first time I explored this delightful combination in baked goods, I discovered my favorite cupcakes in the whole wide world – Irish Carbomb Cupcakes. This time, I decided to make brownies. These brownies are amazing. They’re cakey, but also a little fudgy. The flavor of the Irish cream comes through immediately, but it’s not at all overpowering. Every time I eat one, I’m impressed with how chocolaty and moist it is. In other words if you like Irish cream, you should make these right away. Don’t let the Cooking Light origin scare you. These brownies don’t taste “light” at all. I also made a few changes that may disqualify the recipe from being considered “light” anymore. Note that the original recipe calls for making 16 brownies out of an 9-inch square pan, but let’s be honest – no one cuts their brownies that small. I used Ghirardelli 60% Bittersweet chips and Hershey’s unsweetened cocoa powder. Preheat oven to 350°F. Coat an 8×8-inch or 9×9-inch pan with cooking or baking spray. Measure flour, cocoa, baking soda, and salt into a medium bowl. Whisk to combine. Set aside. Beat 2 eggs in a small bowl. In a saucepan set over low heat, melt butter and chocolate chips slowly, stirring frequently. When completely melted, remove chocolate mixture from heat. Let cool for 5 minutes. Using a 1/4 cup measuring cup, scoop out some of the chocolate mixture and slowly pour it into the eggs, beating constantly to temper the eggs. Stir the egg mixture into chocolate mixture. Add sugar, vanilla, and Baileys. Stir over low heat for 2-3 minutes or until sugar has dissolved. Fold the chocolate mixture into the dry ingredients, stirring just until combined. Pour batter into the prepared pan and bake at 350°F for about 18-20 minutes, or until a toothpick comes out mostly clean. 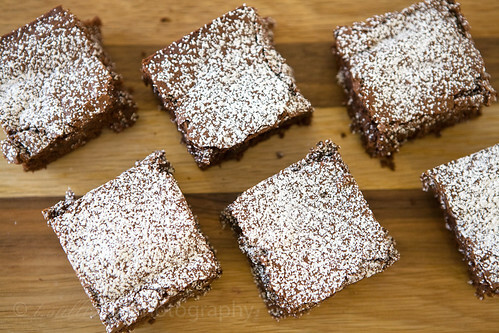 These brownies look so beautiful! Love it! These look delicious! Next time we have bailey’s in the house, I’m making these. You had me at Baileys. 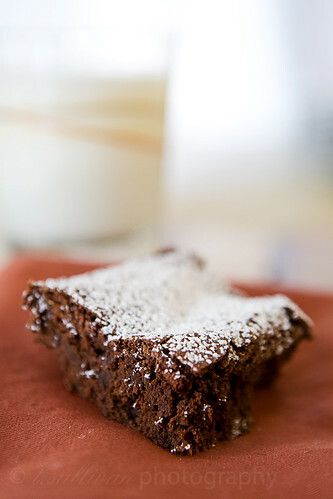 Brownies & Baileys combined is pure bliss! !